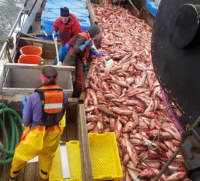 Home/Environmental, Industry News/Was Your Seafood Caught With Slave Labor? Information like this reinforces the important of supporting companies like Pioneer Seafoods to provide, local fresh, sustainably caught seafood. Check our calendar of events page to see when the Pioneer is going to be at Pier 47 selling fresh fish right off the boat. Click here to read the full article on NPR.